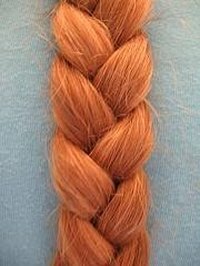 A 3-strand rope is braided the same way hair is braided. It sounds simple, but if you have never done it before, It helps to have someone describe the procedure, or even show it to you. Once you know how to do it, it takes practice to develop proficiency with this or any other type of braiding. Tie the three strands of rope into a knot at one end. Lay the rope strands onto your work area, with the knot at one end and the three strands laid individually, straight, beside each other. You will have a left rope, center rope and right rope. Pick up the left rope and move it over the top of the center rope, laying it down between the center rope and the right rope. Your current left rope was your previous center rope. Pick up the right rope and move it over the top of the current center rope, laying it down between the center rope and the left rope. Start again with the left rope, following steps 3 and 4, until you reach the ends of the rope strands. Tie the 3 strands together with a string, a rubber band or an additional rope.